China Petroleum & Chemical Corp. said its half-year earnings jumped to the highest level on record as refining profits climbed and a rebound in crude prices brought its oil and gas exploration unit closer to breaking even. Net income gained to 42.4 billion yuan ($6.2 billion) in the first six months from 27.9 billion a year earlier, the world’s biggest refiner also known as Sinopec said in a filing to the Shanghai stock exchange on Sunday, citing international accounting standards. That’s the best half-year profit on record, according to data compiled by Bloomberg dating back to 2000. 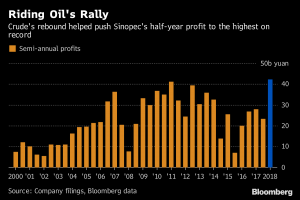 Sinopec flagged the jump in first-half earnings in a profit alert last month, adding that its upstream business had “improved significantly” on higher international oil prices. The company, which makes most of its money from processing oil into fuels, has been burdened in recent years by losses from its exploration and production segment as its aging fields have higher production costs. “Good cost control and better margins from selling higher-grade fuel products helped offset higher oil purchase prices for Sinopec’s refining business,” said Tian Miao, a Beijing-based analyst at Everbright Sun Hung Kai Co.
Sinopec shares in Hong Kong gained 1.2 percent to close at HK$7.52 on Friday. The stock has risen 31 percent this year compared with a 7.5 percent decline in the city’s benchmark Hang Seng Index. Global benchmark Brent crude averaged about $71 a barrel between January and June from $53 a year earlier. 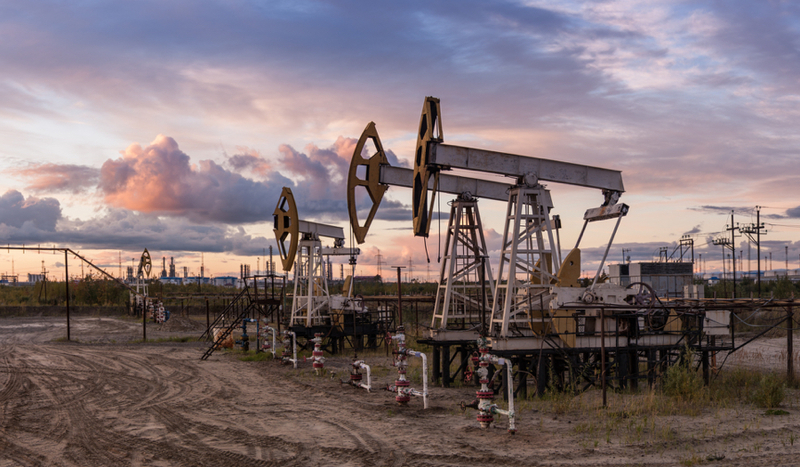 Operating losses from Sinopec’s exploration and production division narrowed to 412 million yuan in the first half from 18.3 billion yuan a year earlier, according to the statement. Operating profit from the refining business climbed 32.5 percent to 38.9 billion yuan, while the chemical segment posted a 29.7 percent gain. Sinopec proposed an interim dividend of 0.16 yuan a share. Revenue rose 11.5 percent to 1.3 trillion yuan. Capital expenditure reached 23.7 billion yuan in the first half, compared with a full-year estimate of 117 billion yuan. On a quarterly basis, Sinopec’s net income more than doubled to 23.1 billion yuan in the three months through June from 10.7 billion a year ago, according to Bloomberg calculations. Rival Cnooc Ltd. said Thursday its net income rose 57 percent in the first six months to the highest level since the second half of 2014. The company pledged higher spending through the rest of 2018 to meet investment targets. PetroChina Co., the nation’s biggest oil and gas producer, is set to post a doubling in profit when it releases earnings on Aug. 30. Company expects crude oil output of 146 million barrels Targets natural gas output of 497.8 billion cubic feet Sees crude oil processing of 121 million tons Plans domestic oil product sales 90.5 million tons.